Can stem cell therapy help runners heal faster? Today we are talking about how runners use stem cells to get back to running faster. But sometimes they aren’t getting better. They feel like they are just waiting, and withering away. So they start searching for an alternative..something better. And sometimes they stumble on the idea of stem cell therapy. In this episode we’re going to talk a little bit about how some runners use stem cells to speed the healing process. Every runner seems to know and believe that their body is fully capable of repairing itself. They don’t necessarily want some artificial surgical implant, pill or injection to artificially manipulate or subvert the natural healing process. Because stem cells simply focus on the body’s ability to fully activate their own healing process, the idea of stem cells really seems to appeal to runners. Stem cells are likely the most powerful source of potential healing currently available to injured runners and doctors alike. The reason stem cells hold so much promise is that they can do everything needed to heal any running injury. It doesn’t really matter if you have an Achilles tendon tear, a partial rupture of the plantar fascia, chronic plantar fasciitis or a torn plantar plate. All of these common running injuries can be difficult to heal. For that healing to take place you have to have a number of different types of cells working together to rebuild the tissue. It takes lots of different types of cells working together to heal the injured tissue when you have a running injury. For example, if you tear your Achilles tendon, you get a very small amount of bleeding in the area where the tendon is torn. That small collection of blood turns into a blood clot. Within a few hours neutrophil cells migrate into the blood clot to start the healing process. M1 macrophage cells rush to the area to remove damaged tissue and debris created from the torn collagen. These macrophage cells release hormones that signal endothelial cells to rush to the site of the tendon tear and begin a new blood vessel formation to deliver more nourishing blood flow and help the area to heal. Fibroblast cells then show up and start laying down microscopic little strands of collagen to repair and rebuild the Achilles tendon. Over time M2 macrophage cells start to come in and remodel and strengthen the collagen to restore the original tendon configuration and make it more functional. Doctors have a term they apply to stem cells which is “pluripotential cells.” What that means is that stem cells just haven’t yet decided what kind of cells they will ultimately become. 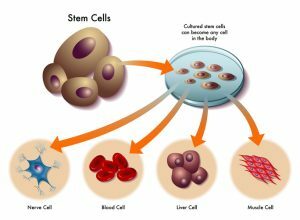 Stem cells can transform into any type of cell in the human body. Stem cells can become endothelial cells that increase blood flow. Stem cells can become fibroblast cells that lay down new collagen to repair a torn plantar fascia or a partial rupture of the Achilles tendon. Stem cells have the potential to transform into any and all of the cells necessary to help speed the healing process. So where do stems cells come from? In the developing embryo the embryonic stem cells will differentiate into every type of tissue necessary to develop the infant’s brain, skeleton, tendons, ligaments, muscles, and all of the other cells that build organs to create that growing little human. In this sense, they are the most powerful type of stem cells. Embryonic stem cells are not only found within the developing fetus but they are also found within the amniotic fluid that surrounds the fetus within the womb. One of the most common ways that stem cells can be harvested is through stem cell cord umbilical cord blood banking and cord tissue stem banking that people do when they are having a baby. When my children were born our doctor collected the cord blood and tissue, packaged it through special process and then sent it away by special courier to preserve it in a tissue bank. The reason we chose to do this was that we wanted to make sure that we have our children’s own stem cells available for future use (if ever needed). Although, of course, we hope it never happens, if our daughter ever develops any serious illness like leukemia that could be treated with her own healthy stem cells that had been harvested long before the disease developed, we have those stem cells in storage. The use of embryonic stem cells harvested from fetal tissue, but it injected into a donor, such as an injured runner, is highly controversial. Not only are there moral and philosophical considerations, there is also a great deal of conflicting science around the use of embryonic stem cells to treat athletic injuries. However embryonic stem cells are commercially available today. Many runners, who become frustrated with the healing process, pursue these types of injection of embryonic stem cells to help tissue heal faster so they can get back to running. But all runners should understand that there is very little solid science supporting use of embryonic stem cells. While there is a great deal of research underway to determine how embryonic stem cells can be used, there is still no uniform definitive process or procedure that scientist or physicians agree will work consistently. Adult stem cells are present in all of us fully formed humans. Adult stem cells can differentiate into other specialized cells and act as a repair system. So most stem cell therapies hope to target the body’s natural healing process by using the power of stem cells to increase the rate of transformation and number of cells that help injuries heal. Perhaps the oldest known stem cell therapy is a bone marrow transplant. Bone marrow transplants have been used for over 40 years as a form of stem cells therapy to save the lives of patients with serious life-threatening cancers and autoimmune diseases. Bone marrow transplants are performed in the operating room using a drill or a large needle to extract bone marrow from the hip or the femur. Obviously, this is an extremely invasive procedure. The stem cells that are harvested from the bone marrow are actually known as blood stem cells. 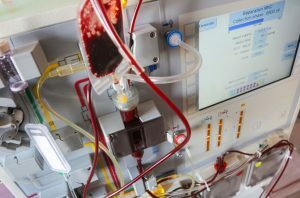 Some physicians advertise that they do blood stem cell transplants, which can be confusing to many runners because these are really bone marrow transplants. 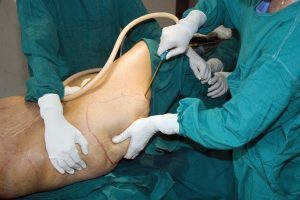 Some doctors will perform liposuction in the operating room and then they process the fat that has been sucked out to isolate the stem cells and inject the stem cells into the injured tissue. 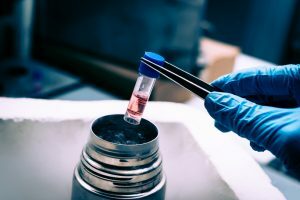 Some doctors take a sample of the patient’s blood, spin it down in a centrifuge and isolate the platelets to perform a platelet rich plasma or “PRP injection.” We have found lots of websites that claim to be performing stem cell therapy but in fact they’re really doing a PRP injection. Now, that is not to discount the value of a PRP injection for an injured runner. Platelet rich plasma (PRP) actually can be a form of stem cell therapy. Platelet derived growth factor (PDGF) is a compound found within the platelets and platelet rich plasma injections that causes stem cells to be released from the blood vessel walls and rush to the site of injury. Those migrating stem cells then transform into the fibroblasts that lay down new collagen and help heal an injured Achilles tendon or torn plantar fascia ligament. So in reality PRP injections are a form of stem cell therapy. They just aren’t the type of stem cell therapy that some people imagine when they picture an injection of collected and purified stem cells being delivered right to the site of the running injury. What is the perceived advantages stem cell for runners? It’s not really complicated why the idea of stem cells appeals to runners. We know that the more workers you have on the job site, the faster you can build a new building. We know that stem cells can form all of the various individual players needed to repair and rebuild tissue quickly. The least appealing thing to a runner is sitting, waiting, or hoping for the normal, average healing process to transpire. No runner wants to hobble around on crutches or sit on the couch for weeks and waste away while they’re waiting for the standard course of healing to occur. Runners put all of this energy and effort into optimizing training and making sure they’re taking full advantage of all their nutrition. They deliberately rest so that they can heal as quickly as possible when their training. So it’s not very surprising that when they have a severe injury like a torn Achilles tendon or a partial rupture of the plantar fascia, they are looking for any potential advantage of healing. The biggest advantage of stem cell therapy is the promise of much faster healing. If you heal faster, you get back to running sooner. What is the disadvantage of stem cell therapy? There are several possible disadvantages with stem cell therapy. Waiting to heal through the “normal process” doesn’t cost anything…other than time… and lost fitness. But stem cell therapy can be expensive. 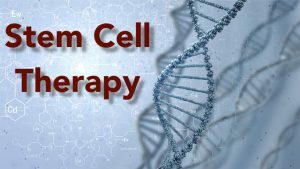 Depending upon the method and the clinic you choose, the cost of stem cell therapy can range from approximately $1000 dollars up to many thousands of dollars. The lowest cost stem cell therapy is probably a PRP or platelet rich plasma injection. We perform these injections for a cost of $1100. Part of the cost involves the equipment. We have to bring a centrifuge and an individual sterile kit containing all of the separation chambers that isolate the platelet rich plasma from the red blood cells and the platelet poor plasma. Embryonic stem cell injections are slightly more expensive because they have been harvested, processed, and preserved by companies that collect that resell embryonic stem cells. Stem cell therapies that involve an operating room are by far the most expensive. Bone marrow harvesting and liposuction procedures require operating rooms. To have an operation you also have to have an additional doctor called an anesthesiologist to make sure that you are unconscious, yet breathing normally during the procedure. Operating rooms are also some of the most expensive real estate on the planet. It can cost hundreds of dollars per minute in surgical facility fees when you are in the operating room. I personally had a relatively routine surgical procedure that involves about 30 minutes of operating room time. The facility fee at the hospital charge for the use of the operating room for about half an hour was $58,000. And that was just the operating room. That did not include the surgical fee, anesthesia fee or any of the other peripheral expenses that go along with surgery. Operations are simply very, very expensive. Stem cell procedures that require the use of an operating room should be expected to cost well over $10,000. I always tell patients that nothing in medicine is free. For every single advantage, there is a disadvantage. For every good thing, there is a bad thing. For every potential benefit, there is a risk. An advantage of embryonic stem cells is that we don’t have to try to harvest them from your body. We don’t have to poke any extra holes in you to get them. So there is no risk of donor site problem such as a complication of liposuction or a problem with the bone healing after we take out the bone marrow. But the biggest risk of embryonic stem cells is that the stem cells harvested from a different human being may not match your body and they could be rejected. As with all donor tissue transplants there is also the possibility of contamination or infection transmission. If you are concerned about the possibility of rejection or transmission of disease from donor stem cells, you can use your body’s own stem cells that are harvested from fat. But the only way to get the fat is through the surgical procedure known as liposuction. Now to be fair, liposuction has been around for a very long time and is a relatively safe surgical procedure. But saying that it is a safe surgical procedure is a little bit like saying I’m going to take up safe skydiving. There is no truly safe surgery. There’s always risk. Even when we perform a PRP injection to try to recruit additional stem cells into your injured tissue and get your running injury to heal faster there is risk. There is a very small risk that you could get an infection when we draw the blood out of your arm. There is a very small risk that you could get an infection when we inject the platelet rich plasma into your Achilles tendon or your plantar fascia to heal the injury. There is also a risk that you could get nerve damage or even a rupture of the injured tendon or ligament when we inject the platelet rich plasma into it. But the truth is, those are risks that you also have with the other forms of stem cell therapy. For those reasons and because we don’t have to perform general anesthesia, a PRP injection is likely the least risky of all stem cell therapies. Are there any guarantees with stem cell therapy? There are no guarantees with stem cell therapy of any variety. In fact, in some states like Texas, it’s illegal for a physician to offer a guarantee. So do not expect any doctor to legitimately guarantee that you’re going to get better with a stem cell therapy injection, or any other treatment for that matter. Instead of looking for guarantees it may be more advantageous for an injured runner to ask the right questions when they see the doctor. 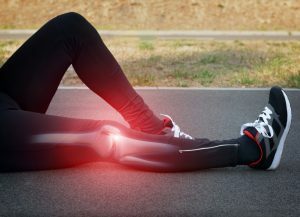 If you are considering stem cell therapy or a PRP injection to treat a nagging running injury should ask your doctor if they have any experience with these therapies and if they routinely treat athletes. I personally believe that athletes are different animals. I think that we heal differently and recovery differently. More important than the injection or the actual therapy that is chosen, pick a doctor who is a running injury specialist and who has a history of treating athletes and understands the nuances of the recovery as it relates to running. The specialized knowledge of recovery from running injuries can be extremely beneficial. One of the worst things about the healthcare system in the United States is that most doctors will only offer therapies that are “covered” by insurance. But one of the enormous advantages of our healthcare system is that there are doctors who are highly specialized and offer advanced therapies for injured runners. Those doctors are everywhere. All you have to do is make sure that you find one in your own area who can help you.